A trawl through my CV to identify major pieces of work I’d produced prompted the discovery of some memorable material – and some I’d forgotten about. The end result was 98 documents all neatly packaged as numbered PDFs and recorded in an index. However, while I expected them to be mostly reports I’d written, the documents turned out to be much more diverse than that. This was because some of my work assignments had been rather open-ended in subject matter and long term in timescale, so there was not necessarily one or more reports that could represent my efforts. Instead, I started looking for documents that would tell a story about my involvement and what had happened. Hence, of the 98 documents, only about half were substantive reports written entirely by myself or in conjunction with others. A further 20 were shorter documents written by myself. The remainder were short documents written with others (16); documents providing context for work I was involved in (17); summaries of what was going on or handover reports when I left an assignment (6); newsletters produced by myself (3); and, finally, two documents were hardcopies of special editions of HCI-related magazines which were on my bookshelf and which I was loath to part with. It was hardly surprising that such a range of documents emerged since the memorable aspects of work involve more than just one’s own efforts, and usually includes what we do with others and what is going on about us. In fact, I had to be pretty selective in my choices since my work document collection includes most of the items that I received and produced; and the index to the collection makes it very easy and quick to list all the documents related to a particular topic or, in this case, assignment. The process I went through for each element of my CV was to first search for any specific document I remembered and wanted to take a copy of. Then, to produce a list of all the index entries related to that assignment and to go through the list (sometimes including a hundred or more line items) and to note the reference number of any that I wanted to look at further. This was a very good test of my newly revamped filing system in which documents are no longer stored in a document management system but simply reside in Windows folders named with the appropriate reference number (see entry in Personal Document Management Journey). It proved very easy and quick to find documents and to open them up – which was a good job because, inevitably, I was having to look at several different documents before making a decision about which one to go for. I had decided before the start of this process that I only wanted to keep electronic copies and that the only hardcopies I might keep would be the fourteen that were already on my book case. That is how it turned out, though I did throw out one of the fourteen – a rather thick spiral bound item which consisted largely of a user manual. None of these items are sturdy enough to stand up on their own – they are either folded papers, stapled papers, spiral bound documents, or magazines. 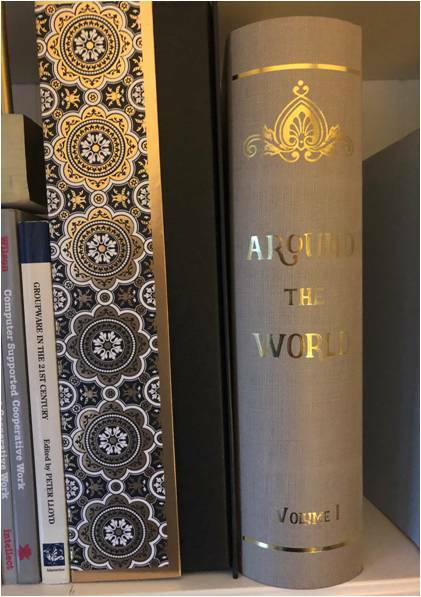 So I acquired a large portfolio box from TK Max inscribed with ‘Around the World’ on the spine – a highly visible distinguishing feature. Four of the hardcopies were in a ring binder, and these too were placed in the portfolio box, together with a printout of the index, so that all this material is now in one place and not flopping around on the shelves. Regarding the electronic versions, in some cases they were stored in my files as PDFs, so little further work was required. However, many were stored as either multi-page TIF files or as MS Office Word or Powerpoint files. These were converted to PDFs using the eCopy PDF PRO application. For the larger documents I created linked content lists in the form of sets of bookmarks, numbered each file, and moved a copy of each file into a special folder setup to be the master of this set of material. 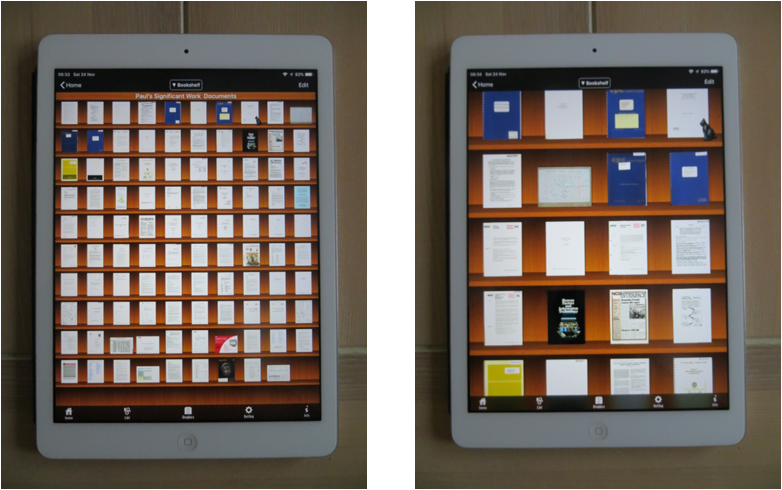 However, my preferred way of viewing such material is within the Sidebooks application on the iPad. Files can be transferred to Sidebooks using Dropbox and this example of system integration works brilliantly. It only took a few seconds to copy all the files (362 Mb in total) and to place them into the Dropbox folder on my laptop. They showed up in the Sidebooks Dropbox area within a minute or two; and then each one was selected in turn and took just a few seconds – none more than 10 seconds – to download into Sidebooks where they can be displayed as either a text list of file names or as variously sized thumbnails as shown below. The exercise is now complete. I don’t know how often I’ll be looking at the documents – probably not very much – maybe never; but, just knowing they are there is a reassuring feeling – not having them there might generate a little nagging wish. Furthermore, going through all this material and being reminded of what I have done has been a very fulfilling experience. As I keep being reminded, in the matter of memorabilia the journey is often better than the destination.